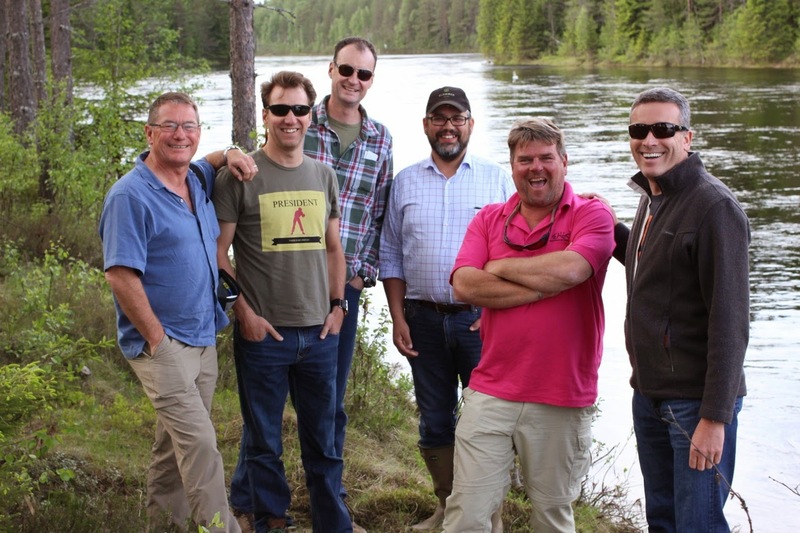 I've just returned from a week of outstanding grayling fishing on the mighty River Trysil in Norway with a great bunch of guys. The visual flashbacks to intense hatches with masses of rising fish are still coming fast and thick and hopefully will take a long time to recede! Back in February, when I was demo'ing at the British Fly Fair International I bumped into my Norwegian friend Ole Bjerke who used to be with Mustad and Partridge in the hook trade. Amongst other things Ole is now building up Gamefish.no to raise the profile of some of Norway's lesser known inland fishing. I've wanted to fish Norway for years and this was a perfect opportunity for me to access the right intelligence... so I asked Ole to tell me which river and which week would provide the best grayling fishing in Norway. A week later he emailed me the answer. Simply as that. I got a group of 5 of us together and off we went. Blown away by the river on arrival! Anders the landowner, in the cap, shows us the 6 kms of river available to us. 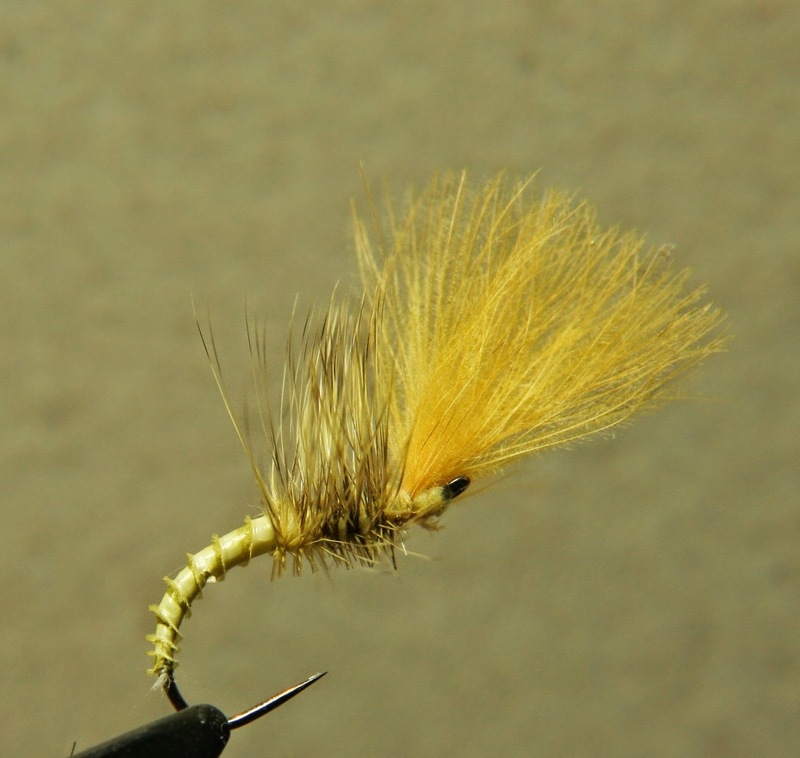 Heptagenia Sulphurea- The Yellow Mayfly... the fish loved them! I won't go into the detail of insect life and what hatches we experienced, you're welcome to contact me for that info: But I will mention that insect life is very healthy with significant diversity and population sizes and I've not seen such intense hatches of BWO's or Yellow Mayfly (Heptagenia Sulphurea) anywhere, ever and with fish so intently focussed on them. Ephemerella Aurivilli and the imitation... the fish liked them too! The Trysil River is huge, 80 meters across on average and with serious flows, just low enough for us to wade given the late snowmelt this spring. It was extremely clear. I watched grayling moving to dries like they were in an aquarium. The river is largely untouched other than a hydroelectric plant with a fish passage which is due an upgrade. Grayling populations are very strong and seem to be most dense in key areas with a lower density sprinkling of individuals in pretty much all habitat types. My favourite type of water for grayling is shallow, broad glides at the tails of pools.... and we found it in spades. Shallow glides heaving with insects and rising grayling. An opportunity to produce cross-and-down drifts, one of my favourite techniques to reach distant fish I cannot wade to. John Grindle got this magnificently marked trout from one of the little woodland lakes. One of the little lakes hidden in the woods, connect to the Trysil by a small stream, home to wily brownies! We caught the majority of our fish on dries. 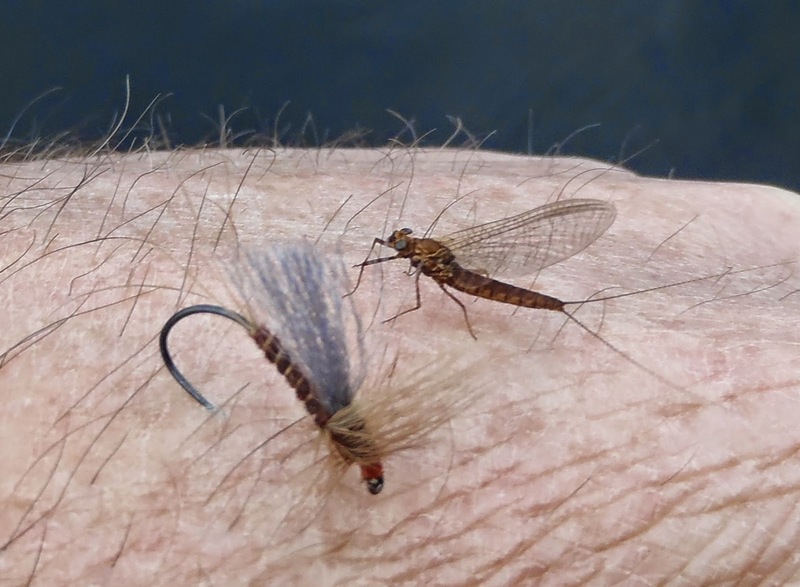 Fly patterns most successful for me were the plume tip (an amazingly dependable producer in any BWO and LDO hatch anywhere in the world it seems) and a range of imitative emergers for the yellows and aurivilli. I had a great session one afternoon bugging in fast deep water with a huge single jig fly which produced 4 big grayling, but the dry fly was supreme. 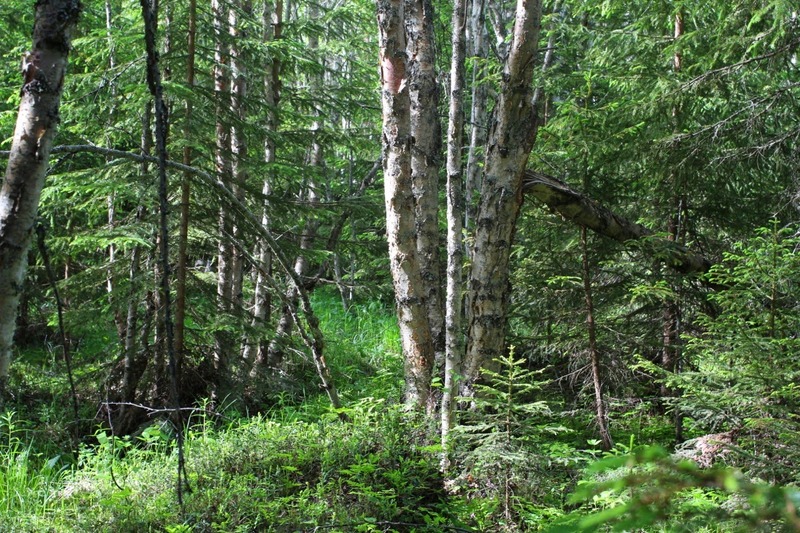 We were fishing on Anders Nyhuus' land, this is a large area of woodland managed for lumber production through sensitive management of indigenous species (pine and spruce) and natural processes. More information on the fishing is here. Anders keeps the numbers down. There were 5 of us and we were the only people allowed to fish his 6km stretch of the river for the whole week. The fish experience effectively no pressure at all. We moved quickly and fished pretty hard and didn't manage to fish every piece of the river, although we visited each area for long enough earlier in the week so we could plan to focus on water that seemed most productive in the conditions (sunny, warm and lots of insects hatching). We experienced very few mosquitoes and biting black fly.... probably because we had regular winds. The accommodation is a very comfortable log cabin which is appropriately rustic (although subtly well equipped, particularly in the kitchen) and it's very comfortable. We caught a lot of fish, probably 150 at least. 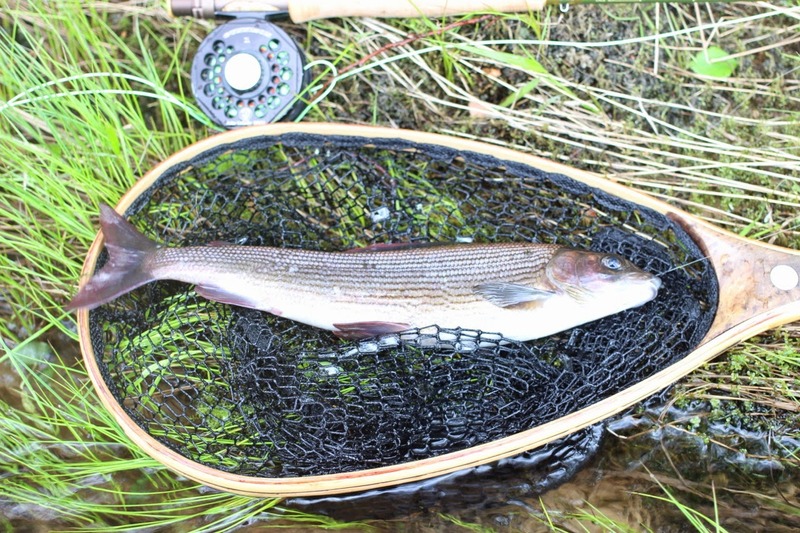 The grayling averaged 25-30cms at a guess. The biggest were around 40cms. There are bigger ones! 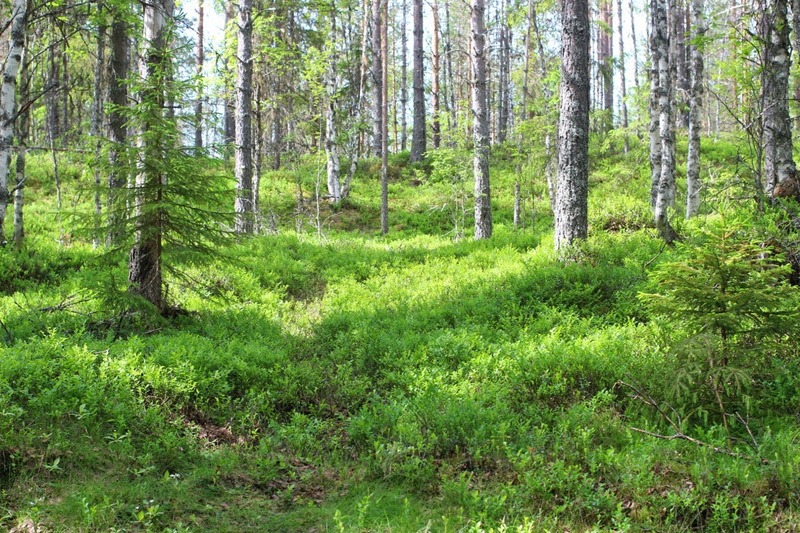 The river flows through dense pine and spruce forest. Walking through it to reach the water is a magical experience. It really sets you up for some serious fishing. 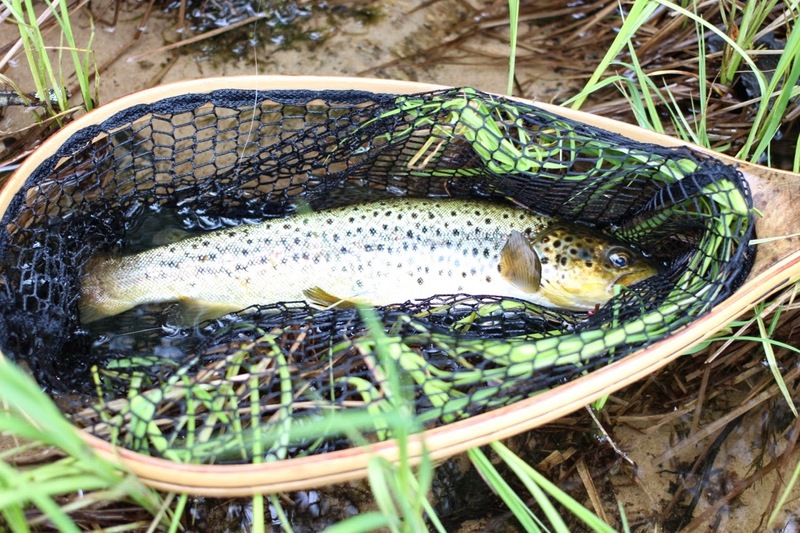 One of the rare browns we encountered in the river... there must be more and bigger ones, we need to figure them out! I have a rule, I'll never return to a river before I get through my list of those rivers I've yet to visit. 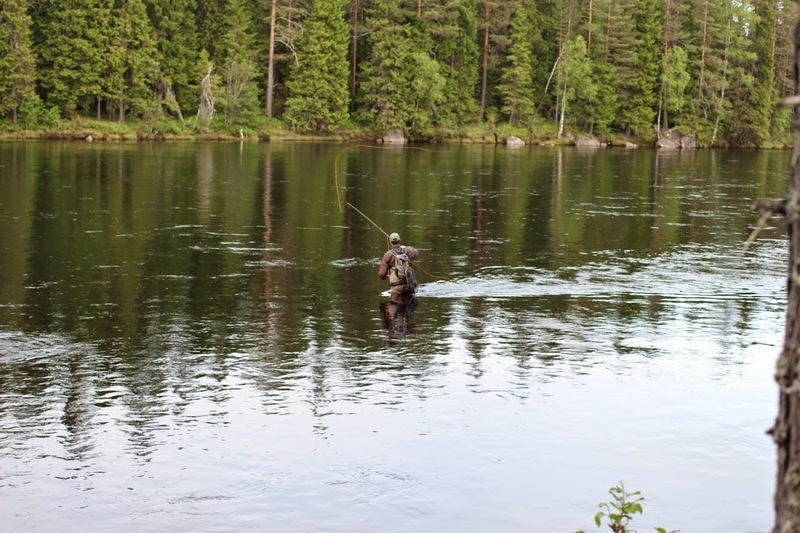 To fish the Trysil again, at Vestsjoberget, I am breaking that rule. Thank you Ole and Anders.... you made me a very happy fishermen... see you next year!